Simply Fundamental (17U Invite Gold), Las Vegas Prospects (16U Select) & Compton Magic Black (15U Ruby) capture titles at 2017 Pangos Spring Sweet 16 in Las Vegas. Elias King of Simply Fundamental (Nevada) named 17U MVP in leading Simply Fundamental to main division title over Vegas Elite 2018. 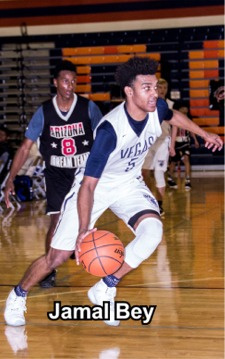 Jalen Hill of Las Vegas Prospects named MVP in 16U, while Devin Tillis of Compton Magic Black named MVP in 15U division in NCAA live Spring Evaluation Period games played at Bishop Gorman High School. The NCAA's Spring Evaluation kicked off this weekend around the country and 88 of the top independent teams participated in the Pangos Sweet 16 held on the campus of Bishop Gorman High School in Las Vegas. front of college coaches, but at the end of the day two of the best who stayed within the team concept advanced to the 17U Invitational Gold Division title game. It was Vegas Elite 2018 meeting up with Simply Fundamental, another Las Vegas Grassroots outfit, and it turned out to be a game of attrition with both teams competing in their third game of the final day of the tournament. The bigger team wore its opponent down, as the shots stopped dropping for Vegas Elite in the second half, as Simply Fundamental went on a 22-11 run to close out en route to a 70-49 victory. Vegas Elite jumped out to a 9-2 lead, but its jump shots stopped falling and Simply Fundamental got the easier looks inside in the second half. Doing most of the damage in the interior was 6-foot-8 2018 forward Elias King (Christian Brothers, Sacramento, Calif.), who finished with 23 points with a variety of finishes in the key and on the break. King, who had 15 points in a 68-56 semifinal win over NMBC Boomers (N.M.), was named Pangos Sweet 16 17U Most Valuable Player. Also playing well in the title game for well-respected Grassroots coach Greg Lockridge was 5-foot-10 2017 guard Morissana Camara (Trinity International, Las Vegas), who finished with 14 points. One of Lockridge's best players during the tournament, as well as one of the best long-term prospects at the event, was 6-foot-3 2020 point guard Daishen Nix (Trinity International, Las Vegas). A crafty point guard who doesn't get rattled or sped up often, finished with seven points and five rebounds. If he gets a bit more explosiveness in his offensive game, we're talking about one of the best lead guards in the national Class of 2020. Simply Fundamental downed Compton Magic Select, 65-60, in the quarterfinals. Vegas Elite 2018 was led by a trio of wing guards all weekend long: 6-5 2018 Trey Woodbury (Clark, Las Vegas), 6-7 2018 Jamal Bey (Bishop Gorman, Las Vegas) and 6-5 2018 Maka Ellis (Sierra Vista, Las Vegas). Bey and Ellis led Vegas Elite 2018 with 13 points each in the title game loss to Simply Fundamental, with Woodbury adding 10 points. Bey, who fields offers from Washington, Arizona St., USC, and San Diego St. among others, led the way with 21 points in the 71-57 semifinal win over L.A. Rockfish (CA). Ellis, who shot the ball from the outside well throughout the event, added 15 points. 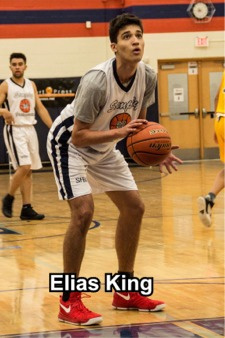 One of the nation's best outside shooters in the class of 2018, Ellis had six 3-pointers in a Friday showcase win over Factory AZ and five (26 points) in Vegas Elite's 80-63 quarterfinal win over AZ United/Team Bayless. 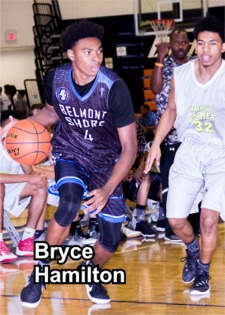 In the 17U Invitational Silver Division title game it was 6-4 2018 Bryce Hamilton (Pasadena, CA) with 29 points along with 6-2 2017 JJ Watson's 25 points that sparked Belmont Shore to a 82-51 rout of OC Pride Red. Vegas Elite's program also had a second team make a championship game at the event. Its 2020 club (which features some eighth-graders in the class of 2021) played up and advanced to the 16U Select Division title game against the Las Vegas Prospects 16U club. It was one of the most well-played and intense games of the event, and at the end of the game it was the bigger and stronger team pulling it out as the Prospects captured the title with a 57-54 win. seconds remaining, as Vegas Elite missed a late potential, game-tying 3-pointer. Jackson punished Vegas Elite inside, finishing with 12 points, while high school teammate Jalen Hill (6-foot-6, 2019) had 18 points and was named 16U Most Valuable Player. Hill was one of the most versatile talents on display all weekend long and was the best player on the court in the 16U title game. Taitz, who posterized a defender on a dunk during the first half, finished with 16 points. Six-foot 2021 prospect Will McClendon (Leadership Academy, Las Vegas) nailed three 3-pointers and finished with 17 points. The Las Vegas Prospects defeated West Elite 2019 (UT) in its semifinal, 72-66, as Hill netted 26 points (no 3-pointers). 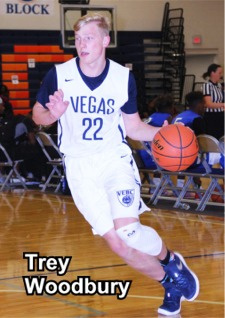 Vegas Elite downed Tres Hoops (AZ) in its semifinal, 70-66, as Taitz had 26 points. A week earlier in the Las Vegas Easter Classic, Taitz had a 42-point performance in an easy win over the Las Vegas Prospects 15U club. In the 15U Ruby Division, 6-foot-3 2020 guard Devin Tillis (Windward, Los Angeles) was named MVP after he joined high school teammate Marcus Joseph Jr. (6-foot-4, 2020) in leading the Compton Magic Black to a 65-49 win over the AZ Rebels. Tillis hit five 3-pointer and finished with 19 points, while Joseph had 20 points.